Provenance: Caye Caulker, a small coral island off the coast of Belize in the Caribbean Sea. How long have you lived in Caye Caulker? I have lived in Caye Caulker all my life except for two years. My heritage is Garifuna, who are descended from the Carib and Arawak Indians that married escaped Africans from two slave ships that sank in the 17th century. 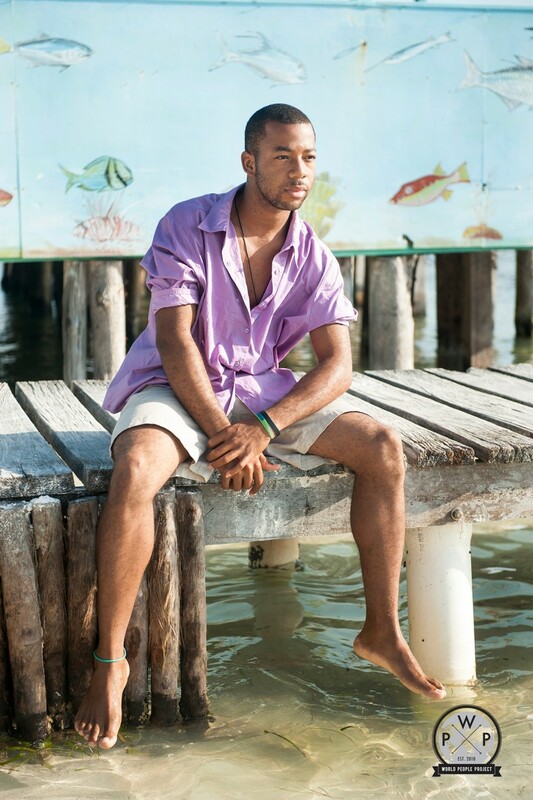 Occupations: A vision for my life started to become clear while studying at Caye Caulker Ocean Academy. I felt complete and at ease when I was creating, whether it was choreographing or doing photography. I was accepted into the Visual Arts and Graphic Design Program at St. John’s Junior College in Belize City. Currently I am working to save money for the tuition fees On the island, like many people, I have done numerous jobs: bike tour guide, waiter, a wedding photographer and I have a reef technician certificate, which allows me to identify fish and coral and take scientific samples. While growing up I did not get much parental support so decided that by volunteering at the local primary school, teaching dance, assisting on field trips or tutoring, I can be a real help to the kids. In the future I would like to be a teacher. Passions and Interests: My passions are many: photography, gymnastics, dancing, poetry, running, volleyball, yoga, aerobics, working out and modelling. I enjoy challenging my body and mind. I am very close to my family, who all live on Caye Caulker. Belize is a poor country and there are very little opportunities to excel at what I am passionate about. As a kid I would have loved to study gymnastics, but on the island there are no facilities. What do people know you for? I know most people on this island and am known to all as having a smile, being friendly and respectful. The Belize Community Police Department awarded me a “Do the Right Thing Award” for being a positive youth role model. Everyone knows that I am dancer and love photography. Thoughts on Caye Caulker? Caye Caulker is a go-slow island and I am so glad to be a part of this magnificent place. There are sharks, rays and other amazing sea creatures in my back yard! It doesn’t get any better than that. The people are so kind and friendly here — I am living in paradise. But even the sun sets in paradise; Belize is a poor country with lots of crime and corruption. It’s heart breaking to know that children don’t have the opportunity to go to school because their parents can’t afford it. I was introduced to Yvon as a person who loved photography. The minute I met him I felt his warm, beautiful and kind personality. Yvon was a great help to me on the island and introduced me to many locals as well as his grandfather Ambrose, who made coconut oil from the coconuts growing on the island. When walking with Yvon, he was constantly greeting someone. I heard from one of his teachers at school that he won an Adobe Creativity Award and was nominated for a Belize Youth Artist Award. Yvon gives much to his community and his love and care of his family and community is evident.